As you know, Annabelle turned six months old last weekend. I am still flabbergasted myself. 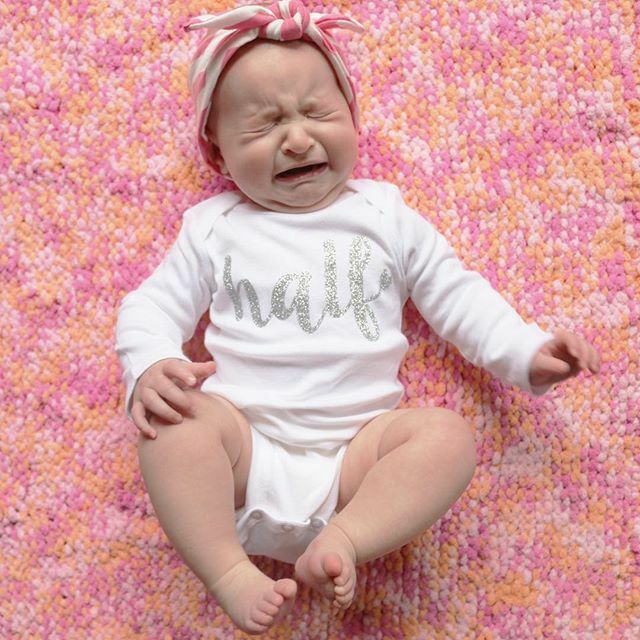 Despite not knowing how that happened, I still wanted to commemorate the milestone, and when I found this "half" onesie, I knew we had to take some photos. Unfortunately, it was super cloudy / rainy ALL WEEK last week here in gloomy Ohio, so we weren't able to go outside to take these pictures like I'd hoped. We also weren't able to get good lighting... or even decent lighting... but I did my best with what I had. I just adore this picture of her crying. This is why she has the nickname Waaaaaannabelle. She's just the cutest tiny human ever when she's angry. And these five are my favorites out of ALL the photos we took (which was practically a billion, ugh) - she has the sweetest little smile, and I just love when she grabs her toes! She's really starting to play more with her feet, and it's fun to watch as she realizes they're attached to her. She can't quite get them to her mouth... this child is not very limber. I wish we could have fed her half of a cake, but I'm not planning on giving her sugar like that until her actual birthday. It's kind of a rite of passage. But maybe we'll do half cakes in the following years! Do you celebrate half birthdays?